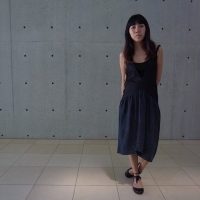 -Sayaka Ohata is an internationally active artist based in Tokyo and Paris. Employing many forms and formats, my works favor material and procedural heterogeneity. I try to develop an art, understand as a process, on the threshold between daily and aesthetic experiences. I was graduated in media art at the Tama University in Tokyo (with Seiko Mikami and Yukiko Shikata) before moving to France to enlarge my artistic approach in Beaux-Arts (with Matthieu Laurette). In general, my way to deal with art has more to do with a mis-en-scene or a staging than making objects in a strict sense. First I create “events”, and then I (re-)use this “encounters” as artifacts to work with them (transform them). I like to negotiate with things which are present around me. Often my experimental explorations and artistic practices question relations of body, social and information. --> I am also part of an artistic collaboration with Joseph Mayrhofer, M-O which investigates space explorations through aberrant movements.